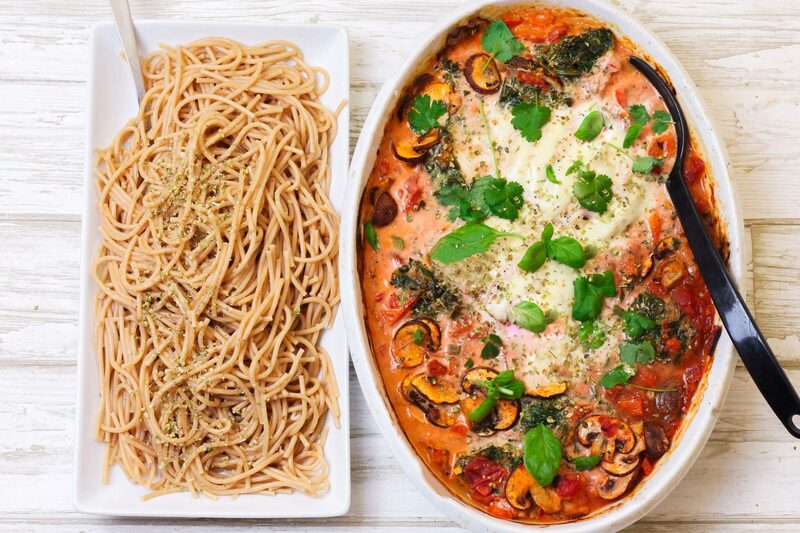 Here we've whipped up a gorgeous casserole with chicken, bell pepper, mushrooms and spinach, to cosy up in the oven in a yummy tomato sauce. We're stuffing the chicken fillets with mozzarella and serving with spaghetti. Look forward to putting your feet up - there's plenty of time to do something else. Enjoy! 1. Preheat your oven to 220 degrees convection. 2. Chop onion and garlic. Rinse and clean bell pepper and mushrooms and cut both into bite-sized bits, the way you prefer. Mix everything in a casserole with chopped tomatoes, pesto, water, oregano and a pinch of salt. 3. Halve the mozzarella ball and slice both halves. Make 4-6 incisions into the chicken fillets - about halfway through, and pop a mozzarella slice in each pocket. 4. Spread the frozen balls of spinach into the dish along with the chicken fillets, and let the lot simmer in the oven for about 30 minutes, until the chicken is cooked through. You can then adjust the flavour with salt and pepper if necessary. 5. Meanwhile cook the pasta according to the packet and serve with the yummy, mozzarella-stuffed chicken fillets and tomato sauce. Tasks for kids in the kitchen: Let your kids slice the mushrooms and bell pepper. They can also slice the mozzarella and stuff it in the chicken fillets. Remember proper kitchen hygiene when handling raw chicken.